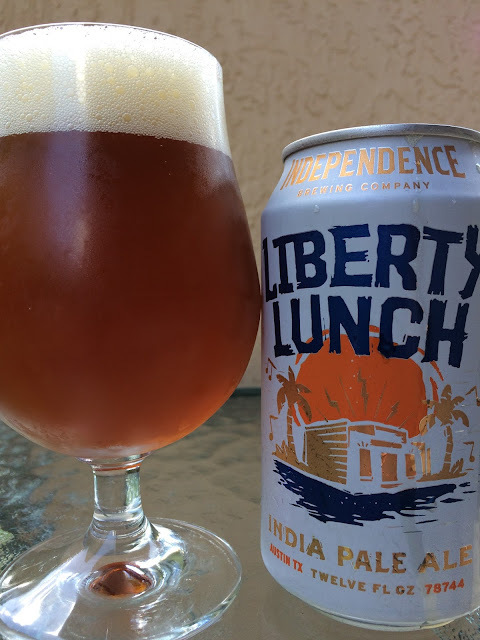 Austin's Independence Brewing recently sent me a few cans of their Liberty Lunch India Pale Ale. The beer was named for and inspired by an iconic Austin music venue that closed in 1999 and showcased tons of "before they were famous" artists including Nirvana and Ween. Here's an article republished from 1999 that shares some of the sentiments from the actual closing. Wiki is also good, just don't write your term paper citing it. The beer is canned and available in many Texas markets. "Music Feeds The Soul" adorns the can. 5.5% alcohol. Very nice aroma full of honey and jammy sweetness, fruity orange citrus and tropical scents. Fruity tangerine and melon flavors come first. Honey sweetness meets citrus and a hint of pine. Light spiciness, hoppy, good body. On the sweet side but very good and I liked it! Check it out if you're in Texas and if not, everyone has a friend in Texas that will grab you a can!